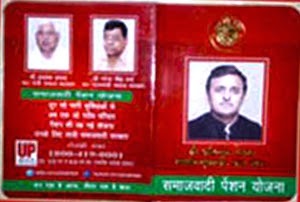 UP Samajwadi Pension Yojana is a scheme launched in Uttar Pradesh for providing financial assistance to the economically weaker families and people of the societies in the State. The scheme has been designed in a way that the people belonging to the BPL or Below Poverty Line category get the required help and support from the scheme. The major objective of the Samajwadi Pension Yojana is to provide the required financial help to the people or families of the BPL category to lead to a normal life. There are many families in Uttar Pradesh, special in the rural area, that do not have any major means of income. They live under the poverty line and many do not even have money to buy two square meals a day. So the UP government has taken the initiative of launching this scheme that would help these families financially and help them with their basic needs. The scheme would give preference to the families and individuals who belong to the SC/ST/OBC or BPL category. Under this pension scheme the families registered with it will eligible for a monthly pension of Rs.500. every financial year the amount s raised by Rs.50. The maximum amount to be paid to a family in a month is Rs.750. Under this scheme the transaction and application process can be made online. The pension amount will also be transferred electronically to the accounts of the families registered for this scheme. For the financial year 2016-17 nearly 40 lakh families of the State will be covered which would comprise of 12 lakh SC/ST, 10 lakh Minority, and General/OBC 18 lakh families. The applicant who is a resident of Uttar Pradesh can apply for the scheme. A State resident proof would be required. The families who have children between the ages of 6 to 14 years, should be registered to a Government school and their attendance should be a minimum of 70%, in order to apply for the scheme. The applicant needs to have an account in any of the nationalized banks. This is because the pension amount will be sent to the registered persons account. Having a State Bank Account would be preferable. The family member registering for the scheme should be qualified to a minimum school level, if not he or she must get admission under Rashtriya Saksharta Mission after registering for the scheme. After registration it is necessary for the families having children below the age of 6 years, to get a medical test done on the children in a government hospital and get all kinds of vaccinations. Also once registered to the scheme the deliveries in the registered families should take place in public hospitals. People falling under the category of homeless families, widow, divorced women, sweeper, physical handicapped, will be given primary preference under this scheme. If you own a motorized vehicle (two, three or four wheeler) you cannot avail this scheme. Families or individuals owning a home or a land of 0.5 hectare cannot apply for the Samajwadi Pension Yojana. Any income tax payee, government employee, pensioner, private firm employee, NGO employee cannot avail this scheme. Step 1– You have to log in to the official website of the scheme that is- http://sspy-up.gov.in. Step 4– Along with the form attached the scanned copy of all the required documents and upload the form and the documents on the website. After this your details and form will be verified by the government and then you will be notified about your Samajwadi Pension Yojana account. The impact of launching such pension scheme would provide lots of benefits of SC/ST families and also for families who are below BPL in the state.